If you have ordered printed apparel before, you’ve probably asked this question. It’s difficult to understand the need for minimums without understanding the process of setting up a screen printing job. Maybe your printer took the time to properly explain it to you, or maybe they just mumbled some stuff about time and set up, either way, lets dig into this a little deeper. 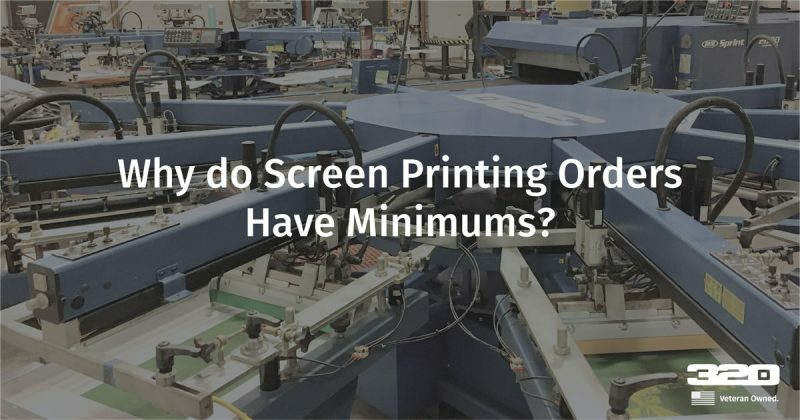 Most shops have a minimum screen printed order qty. They are not all the same, some have low minimums of 12, some are at 24, and some are higher. The minimum depends on the shops overhead and capabilities. With traditional screen printing, it takes the same amount to time to process and set up a job regardless of how many shirts you want. So if you want 1 shirt, or 100 shirts, the time the shop invests in your order to get it to press is the same. That includes customer services, billing, art separations, screen prep, registration, inking and test print. Lets say the time invested by the shop for this order is $200 after we account for all the time each department spent on the order, the cost of employees, materials, overhead of the building, etc. So, if you only want 1 shirt, the shop would have to charge you $200 for the shirt, just to make NO money. After the horror and hatred wear off your face, they would have to explain this all to you so you don’t leave and tell all your insta-snap friends that they are an awful establishment and are outrageously priced, (not that we think anyone would ever jump to conclusions without having all the information, that NEVER happens 🙂 Rather than go through this scenario multiple times a week, shops will do little math and establish what their minimum print orders can be to still be profitable. Some shops utilize DTG (Direct to Garment) machines. Think oversized ink jet printer that can print on shirts. These machines do not require any set up or screens, just upload the design, and printer does the rest. So why isn’t everyone using these? These are not going to give you the same quality as traditional screen printing, but for one-off pieces, it is usually good enough. These machines also take longer per shirt, so if you wanted 50 shirts, traditional screen printing would still be a better fit. Heat Press. Some shops also offer cad cut vinyl film that can be heat pressed. This method works well for one color simple designs, like if you wanted to make a single shirt with some funny text on it for a party. I hope you found this article helpful! Remember to subscribe to our newsletter if you’d like to be informed when we post new content. Thanks so much for reading.